Anyone can develop obstructive sleep apnea, although it is much more common in people over 60, obese or smokers. If you snore very suddenly wake up during the night with feeling of being choked and feel very sleepy during the day, there is a chance that you are being affected by obstructive sleep apnea. In this article we explain the obstructive sleep apnea, emphasizing the causes, risk factors, diagnosis, symptoms and treatment options. Obstructive sleep apnea is a disorder characterized by short, repeated interruptions of breathing during sleep. It occurs when the muscles of the upper respiratory tract relax while we sleep, causing soft tissue in the back of the throat collapse, blocking the passage of air towards the lungs. 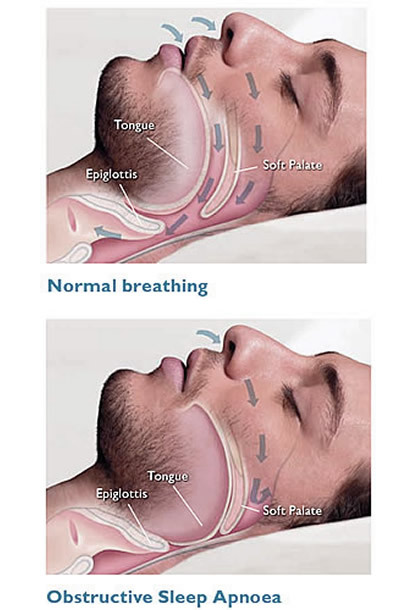 The relaxation and the consequent collapse of the pharyngeal muscles may cause partial or total reduction of breathing events that receive, respectively, the names of hypopnea and apnea. Episodes of airway obstruction usually last between 10 and 30 seconds, but some can persist for more than a minute, causing significant reductions in oxygen saturation in the blood. The sudden drop in blood oxygenation rate alerts the brain that responds causing a sudden disruption of sleep for the individual to breathe again. This pattern of airway obstruction followed by sleep disruption can occur hundreds of times in one night. The patient may wake up suddenly, with feeling of being suffocated or choked, however, in less severe cases, the superficiality of sleep can be so ephemeral, that individual back to sleep immediately and then does not remember waking up. The result of sleep apnea is a standard fragmented sleep, not restorative, which often results in an excessive level of daytime sleepiness. And the most curious is that many patients do not even suspect that the cause of your excessive sleep is the fact that sleep poorly, since they do not remember waking up several times during the night. Obstructive sleep apnea syndrome is an extremely common disorder. It is estimated that about 20 to 30% of the adult male population and 10 to 15% of the adult female population suffer from this illness. Only a minority of these individuals, however, the diagnosis is properly set by a physician. The relaxation of the respiratory muscles are common during sleep, and in most people it is not intense enough to cause airway obstruction. So that obstructive sleep apnea occurs, some other factors need to be present. Obesity, advanced age, smoking, family history and abnormal anatomy respiratory tract usually the most important risk factors. But they are not the only ones. Next, we'll describe the most common risk factors for OSA. Age - sleep apnea is rare in children and will become increasingly common as we age. From the age of 50, it becomes quite prevalent. Obesity - probably the most important risk factor is overweight. Only 10% of men with normal BMI have OSA, while among men with BMI greater than 30 kg / m² this rate is over 60%. Gender - OSAS is 2-3 times more common in men. However, after menopause, this difference is greatly reduced. Anatomic abnormalities - changes in the skull bones, mostly a short jaw or jaw, hypertrophy of the tonsils, adenoids hypertrophy, deviated septum, nasal polyps or have a short and wide neck are factors that favor the appearance of obstructive sleep apnea. Nasal congestion - People who have frequent rhinitis are also at higher risk. Cigarette - OSAS is three times more common in smokers than in nonsmokers. Alcohol - Alcohol consumption increases the relaxation of the pharyngeal muscles during sleep, favoring the onset of airway obstruction. Tummy sleeping up - a position that favors the obstruction of the airways is called the supine position, which is the belly up position. Thus, beyond the collapse of the pharyngeal muscles, there is also great risk of falling of the tongue towards the throat. Daytime sleepiness is one of the most common symptoms of OSAS and is often the reason why the patient seeks medical help. It is important to distinguish drowsiness fatigue (tiredness). The first is an inability to stay fully awake or alert during the day, while fatigue is a subjective complaint of lack of physical or mental energy. Initially, daytime sleepiness may go unnoticed or be underestimated, because the picture usually develop very slowly over months or years. The patient may not describe the symptoms as drowsiness, using other terms, such as fatigue, tiredness, depression and lack of energy. However, if the patient is asked to carefully, usually proves to be a pattern of excessive sleepiness with frequent sleep during passive or monotonous situations such as readings, lectures, church services, watching television, going to the movies or even while driving a car. The excessive consumption of coffee during the day can also be a sign of excessive daytime sleepiness. Some patients complain more of insomnia than in daytime sleepiness. Usually this occurs in individuals with repeated episodes of apnea during sleep, which prevents the patient's entry into the deep sleep stage. This type of abuse is more common in women. Snoring during sleep is another typical feature of obstructive sleep apnea. It should be a clarification, not every patient who snores has OSA, but more than 90% of patients with OSA snore. So, put another way, the presence of snoring is not sufficient to make the diagnosis of sleep apnea, but their absence makes the OSA an unlikely hypothesis. The obstructive sleep apnea should not be the first diagnosis in lean subjects with mild snoring, but it is a very likely scenario in the case of obese people who snore loudly. The partner's presence (a) or any family to sleep in the same house often important during medical consultation, they usually have a knowledge of the sleep pattern better than the patient himself. Events associated with sleep, such as snoring, breathing interruption periods, night shaking, choking or sudden episodes of startled awake are more easily observed by those next door. Suddenly wake up with a feeling of suffocation, choking or suffocation. Often wake up with a dry mouth or sore throat. Switching periods of breathing during sleep, lasting at least 10 seconds. Wake up with chest pain. Patients with OSA have an increased risk of accidents or development of clinical disease. Accidents - Traffic accidents are two to three times more common among patients with OSA than in the general population. Individuals with sleep apnea should not drive, operate heavy machinery or receive responsibilities that require careful monitoring. Cardiovascular disease - Patients with OSA, particularly in moderate to severe cases, are at increased risk of developing a wide range of cardiovascular complications, including hypertension, pulmonary hypertension, coronary heart disease, cardiac arrhythmias, heart failure and stroke. Diabetes and Metabolic syndrome - Patients with OSA have a higher prevalence of prediabetes, diabetes and metabolic syndrome. Although these diseases are clearly related to obesity, the existence of OSAS is an additional risk factor. Depression - Several studies have shown that patients with OSA have an incidence roughly twice of depression than the general population. Operative complications - Patients with obstructive sleep apnea, which need to be operated for any reason, are at higher risk of surgical complications, such as acute respiratory failure, cardiac events after surgery or need for postoperative driving care units intensive. Mortality - Patients with severe OSA and untreated have two to three times higher risk of death from any cause when compared to individuals without the disorder. Patients with a history to suspect sleep apnea should be evaluated with a polysomnography, which is usually performed in specialized centers for treatment of sleep disorders. Polysomnography is a noninvasive test in which the patient sleeps while the medical staff makes a complete record of the activity of the body, including the brain electrical activity, breathing rate and heart, muscle tone, eye movements and blood oxygenation rate. Five or more obstructive respiratory events, apneas type, hypopneas or sudden awakening with shortness of breath, every hour of sleep, associated with at least one typical symptom of OSA described in the previous section. Fifteen or more obstructive respiratory events per hour of sleep, regardless of the presence of other symptoms of OSA. Patients who meet criteria for the diagnosis of OSA are traditionally classified as mild disease patients, moderate, or severe based on their symptoms and the results of polysomnography. Obstructive apnea mild sleep - Patients with 5-15 respiratory events per hour of sleep. These patients usually have few symptoms and daytime sleepiness is bland, not being able to affect the quality of life. Cardiovascular complications do not usually occur. Obstructive sleep apnea moderate - Patients 15 and 30 respiratory events per hour of sleep. These patients often notice significant daytime sleepiness, which can interfere with daily activities. In this group, there is already an increased incidence of automobile accidents, and complications such as high blood pressure, may already exist. Obstructive apnea severe sleep - Patients over 30 respiratory events per hour of sleep or have to polysomnography significant drops in oxygen saturation in the blood (oximetry below 90%) in at least 1/5 of the exam time. These patients have great daytime sleepiness and tend to fall asleep often during the day, even sitting. Severe OSA patients have an increased risk of mortality from cardiovascular complications or accidents. Treatment of OSA aims to end or minimize episodes of apnea or hypopnea and improve blood oxygen saturation in the blood during sleep. In mild cases, simple measures can be effective. In the more severe forms, respiratory may be required. The most important attitude is slim if the patient have a BMI above 25 kg / m². The physical exercise regularly also helps. Reduce the consumption of alcohol and stop smoking are essential. Avoid sleeping on his back can help reduce the number of respiratory events during sleep. Sleep medications such as anxiolytics, should not be used without medical supervision, as they may increase the risk of sleep apnea. The CPAP is an acronym that means Continuous Positive Airway Pressure (continuous positive airway pressure). It is a very effective method for moderate and severe forms of sleep apnea. CPAP is a treatment consisting in the use of a respiratory machine that provides pressurized air through a mask which must be attached to the patient before bedtime. The CPAP reduces the number of respiratory events in the evening, reduced daytime sleepiness and improves the quality of life of the patient. Although CPAP is the most successful method and most commonly used to treat obstructive sleep apnea, some people find the mask is uncomfortable or noisy machine. The most recent machines, however, are smaller and produce less noise and to older machines. For patients with mild to moderate OSA who can not tolerate or unwilling to CPAP treatment, an oral device that hits the positioning of the jaw and the tongue is a possible alternative. The positive airway pressure is generally more efficient, but most patients eventually adapting better oral appliance. Adherence to treatment is an essential aspect of success, the use of oral appliances ends up being an acceptable alternative. In cases of severe OSAS, but only CPAP is an effective option. If none of the treatments work, surgery to correct anatomical abnormalities may be the solution. Surgery, however, is reserved for specific cases and only given after careful medical evaluation.